Both essential oils and meditation are rooted in ancient civilizations. The Egypt civilization was known to have used essential oil as far back as 4500 B.C. Meditation, or more specifically mindfulness meditation is believed to have its root in Buddhism and Hinduism. For decades, mindfulness meditation has grown beyond religion and has been adopted by modern practitioners as a secular practice. Thanks to mindfulness teachers like Jon Kabat-Zinn, mindfulness meditation has gained popularity in the West. Mindfulness meditation has been proven scientifically to offer a range of benefits to our health, both physically and mentally. When you’re living a fast-paced life where you often neglect your mental well-being, meditation is the way to develop the mental agility to deal with the stressors in life. To put it in simple words, mindfulness meditation is about training your mind to detach itself from the stream of thoughts and emotions. It also allows you to focus on the present, instead of wallowing in past regrets or getting anxious about future worries. Should You Use Essential Oil When Meditating? 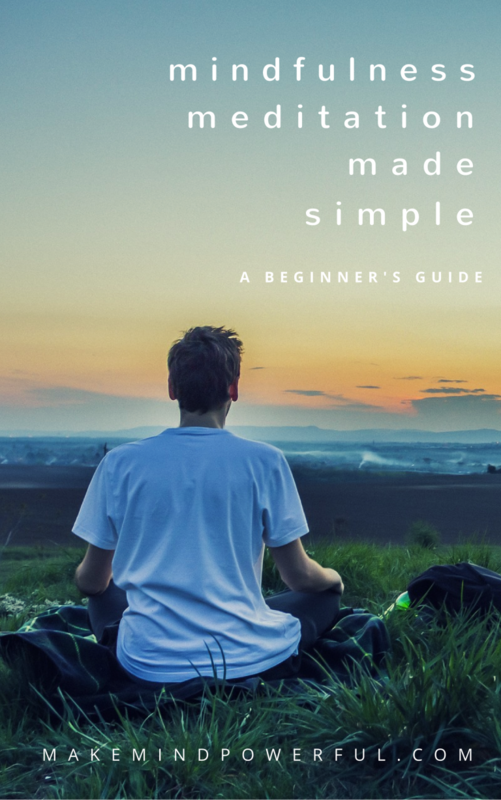 Learning mindfulness simple, as there are only a few basic instructions to get you started. Mastering meditation, or being able to descend into calmness quickly takes years of practice. For newbies, unguided meditation often results in frustrations and aggravate the stressful emotions. Try meditating when you’re overwhelmed by stress and anxiety and you’ll know what I mean. You’ll spend the entire meditation session wandering and trapped in negative emotions rather than practicing mindfulness on your breath. Unlike you’ve been meditating as a monk, you may need an external element to ground your thoughts initially. Certain types of essential oils have long been used as a natural remedy to calm anxious minds. The pleasant aroma of the oil helps to support your meditation practice. Essential oils are highly potent concentrated liquid extracts that are derived from plants or herbs. They are highly absorbent and also evaporate quickly. There are two commonly used methods for using essential oil during meditation. The first involves diluting the essential oil with a carrier oil before applying it on your wrist. At such close proximity, you’ll be calmed by the essential oil vapor that permeates your immediate surrounding. A second method involves using aromatherapy diffusers. Ultrasonic and nebulizer diffusers are preferred as they do not generate heat that may destroy the calming properties of the essential oil. Just add a few drops of essential oil into the water-filled diffuser and turn it on. This will disperse the aromatic scent to the entire area of your meditation room. Every single type of essential oils is unique in terms of aroma and therapeutic properties. To aid your meditation practice, here are a few points to consider when choosing an essential oil. Calming and Focus – There are certain types of essential oils like frankincense and lavender that are known to promote calmness and focus. These oils are ideal for promoting your meditation practice. Non-drowsy – I would personally avoid chamomile essential oil as it may induce drowsiness. Use chamomile if you’re trying to get a good sleep but not for meditation. Extraction Process – It is important that the therapeutic properties of the essential oil are preserved during the extraction process. Common methods used are the steam distillation, cold pressed and CO2 supercritical extraction. Essential oil blend – The beauty with essential oil is that when they are blended in a specific formula, it creates a synergy that enhanced the total effects of the individual oil. Purity – Essential oil should be undiluted and in its purest form when delivered in a bottle. Ensure that the manufacturers conduct third-party testing for their batches essential oil to ensure no additives or pollutants are present. Essential oils are an effective aid for your meditation routine. However, there are precautions that you should always bear in mind when using essential oil. Avoid direct contact with undiluted essential oil on your skin. It may cause side effects like itchiness. Instead, dilute the essential oil with a carrier oil like fractionated coconut oil. You should never apply essential oils in your ear, nose or eye. If you experience any side effects with a particular type of essential oil, discontinue usage. Keep your bottles of essential oils out of reach from children. Do not ingest essential oil. Not all essential oils are safe to be taken orally. Always consult your doctor if you intend to take essential oil orally. When it comes to meditation, you’ll want to get essential oil that promotes focus and concentration. I’ve put together a list of commonly used essential oils by meditation practitioner. Personally, lavender works for me. Frankincense is coined from the term ‘fran ecens‘, which carries the meaning of quality incense in French. This essential oil is extracted from the resin of Boswellia species, a tree that’s commonly found in the region of India. The burning of Boswellia resin is a common practice in religious practice and is believed to provide a calming effect. This is further strengthened by a scientific study, that pinpoint incensole acetate, an active compound that produces an anti-depressive effect. 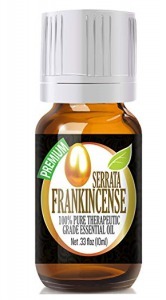 Healing Solutions offers one of the best frankincense essential oils for meditation. Adding a few drops of the oil in a diffuser will soon fill your meditation space with scents of woodsy pine that helps to ground your mind for meditation. The essential oil is produced in a GMP certified distillation facility and stringently tested to ensure it is in the purest form. Some buyers do not like the smell. Myrrh is a resin derived from trees that belong to the Commiphora family and is widely known for its medicinal properties. It is arguably the most commonly used essential oil on the planet and history of myrrh traces back to ancient civilizations. Two of the most important component of myrrh are Monoterpenes and Sesquiterpenes. Besides its strong antioxidant properties and potential benefits for fighting cancers, myrrh has a calming effect when inhaled in aromatherapy. 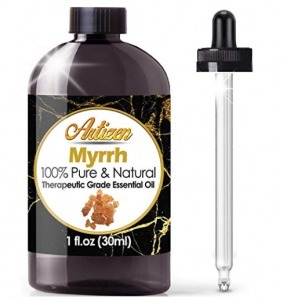 This Artizen myrrh essential oil is a great option to get rid of negative emotions that are disrupting your meditation. It contains no artificial additives and you’ll get only pure undiluted essential oil extracted from the myrrh resin. The essential oil is shipped in a UV-protection coated bottle to prevent the therapeutic properties of the oil being damaged by exposure. You’ll also get a high-quality glass dropper for inserting the essential oil into your diffuser. Protected in UV coated bottle. The healing qualities of lavender were known to humankind more than 2,000 years ago. The floral scent of lavender is unmistaken to many and it is one of the most popular essential oil to combat stress and anxiety. Lavender oil has been proven effective by science in a study on 221 participants diagnosed with anxiety disorder. The scent of lavender also helps to promote a calming environment for people struggling with insomnia. 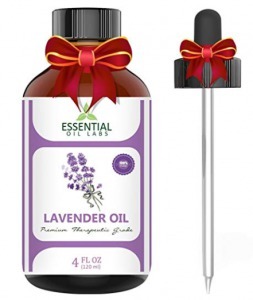 This lavender essential oil offered by Essential Oil Labs only uses lavenders that are ethically sourced in Bulgaria. The oil is extracted with the steam distillation process to ensure the therapeutic qualities remain protected. This undiluted bottle is also free from any harmful pesticides. After adding a few drops of this highly concentrated oil into a diffuser, you’ll find your thoughts slowing down as the scent of lavender starts calming your nerves. It really helps when you’re having difficulties to meditate when you’re highly stressed out. Pure essential oil that is free from pesticides. Some people may not be comfortable with the scent. Sandalwood is a class of fine-grained wood from the Santalum species. As the wood retains its fragrance for decades, Sandalwood is commonly used for religious ceremonies in India and other Eastern civilizations. While there are a variety of Sandalwood species, the highest quality is known to be the Santalum abum that is native to India. Various studies have also suggested that sandalwood helps to increase focus and concentration, which is helpful in meditation. When getting sandalwood essential oil to aid your meditation, you’ll want the oil to be extracted from the highest quality of sandalwood species, just like this bottle produced by Aviano Botanicals. The unmistaken sweet aromatic scent of sandalwood as you unbottled the essential oil is a testament to its purity and quality. This highly concentrated essential oil is claimed to be triple the potency of other competing sandalwood oil in the market. Whether you’re applying it topically prior to meditation or using a diffuser, the scent of sandalwood will help to ground your thoughts as you meditate. Harvested from high-quality Sandalwood trees in India. Subtle sweetness scent of sandalwood. Not the cheapest option around. Roses are a beauty to behold and a symbol of romantic love across the planet. But beyond visual appearance, roses, especially those from the Rosa Damascena family possess a string of healing properties. 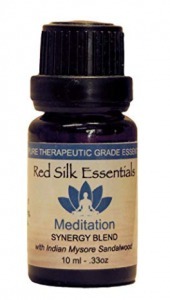 This made it a great essential oil to use when meditating. One of the greatest healing properties of rose is relieving anxiety and depression. A clinical trial involving 772 participants has clearly demonstrated the potency of rose oil in promoting anti-anxiety effects and reducing depressive symptoms. 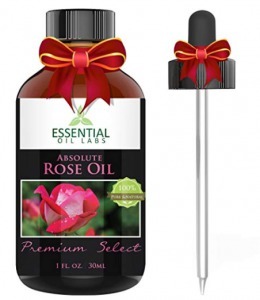 Essential Oil Labs offers one of the highest quality rose oil that was harvested from the Himalayan mountains and free from chemicals. The refreshing smell of rose when the oil is dispersed is similar to having a bouquet of roses in your meditation room. You’ll find using rose oil during meditation particularly helpful, especially if you’ve been struggling with anxiety and depression. As the active components from the rose oil soothe your mind, you’ll find it easier to focus and meditate. High quality rose from the Himalayan mountain. A pleasant scent of roses. Too overpowering for some individuals. 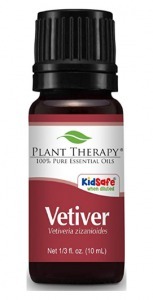 Vetiver is a type of bunchgrass that is native to India. The plant is known to survive in a harsh environment where the soil is dry during hot weather. The warm earthy scent has made vetiver a popular remedy for stress and anxiety since ancient days. Meditation trains the mind to be alert and vetiver essential oil definitely helps with that. A scientific study suggested that the inhalation of vetiver essential oil helps in increasing alertness besides promoting anxiolytic effects. This high-quality vetiver essential oil by Plant Therapy is produced from the roots of vetiver bunchgrass through steam distillation. Each batch of the vetiver oils is tested by both essential oil experts and laboratories to ensure its appearance and content is as specified. After diluting the reddish brown vetiver oil in a diffuser, you’ll have your meditation space engulfed with the smoky, earthy scent of vetiver. This aroma helps to ease of worries from your mind and start meditating with ease. tested by essential oil experts and laboratories. As the name implies, cedarwood is basically pieces of wood that originate from the cedar tree. There are a few species of cedarwood tree and the Juniperus virginiana, also known as Eastern red cedar is commonly used for essential oil. There are over a dozen health benefits associated with cedarwood essential oil including promoting stress relief. A scientific experiment jointly conducted by Toyama University and Kao Corporation in Japan has shown that cedrol, a natural substance in cedarwood has a sedative effect on the brain. 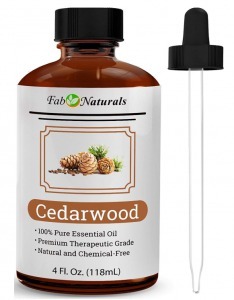 This bottle of cedarwood essential oil by Fab Naturals is obtained through a proprietary steam distillation process to ensure that the therapeutic qualities remain intact. It does not contain any harmful toxins or chemicals that are found in inferior quality essential oils. As you diffuse the cedarwood oil, you’ll be greeted by a grounding aroma that induces positive mood. The rich and warm scent of cedarwood helps you to achieve concentration easily when you’re trying to meditate. Extracted with a proprietary steam distillation process. A powerful aroma that relaxes the mind. The scent may be uncomfortable for some individuals. Bergamot essential oil is extracted from the peel of Bergamot fruit, or rather a type of citrus fruit that grows on the Bergamot plant. First discovered in South East Asia, Bergamot was popularized in Italy and was named after the city of Bergamo. It has a range of healing properties including its ability to relieve depression. In a study that was published in 2015, bergamot oil exhibits a positive effect in chronically stressed rats and decreases depressive-like symptoms. A different test also links the use of bergamot essential oil to relaxation in human. NOW Food has been a nutritional supplement industry leader for more than 50 years. The exemplary quality of its products is reflected in this bottle of bergamot essential oil. Is tested with modern facilities to comply with a strict level of quality control. Its citrus-like scent would permeate your room in a diffuser and helps to uplift your mind instantly. This helps beginners to meditate, especially if they’ve been struggling with depressive thoughts. Strict testing by modern laboratories. Sometimes, having a synergistic blend of essential oils from various plants can be the answer to a smooth meditation session. This essential oil blend by Healing Solutions is produced from a harmonious blend of Cananga, Clary Sage, Frankincense, Lavender, Patchouli, Sweet Orange, Thyme and Ylang Ylang extract. The plants and herbs are sourced from the finest farms and went through a strictly controlled distillation and bottling process. The soothing aroma that emanates from the oil is perfectly balanced to soothe troubled minds. It helps you to focus during meditation. You can be assured that the potency of the essential oil is preserved during delivery, thanks to the amber glass bottle. A dropper cap is also included to help you measure the right amount of essential oil to apply. Strict distillation and bottling process. This is another meditation blend that can transform your meditation experience in a good way. Produced by Red Silk Essentials, the oil is made of exotic Indian Mysore Sandalwood, Myrrh, Cedarwood, Fir Needle, Spruce, Labdanum, and Lavender. Each bottle of essential oils is extracted by steam distillation before they are thoroughly tested for impurities. The unique blend produces a harmony aroma the help to ground your thoughts during meditation. The oil is highly effective in calming your mind without causing any drowsiness. The bottle has a built-in dropper that simplifies inserting the oil into a diffuser. Perfect balance of 7 exotic essential oil. Helps in grounding your thoughts. I hope you’ve found your own personal choice of essential oil from this list to enhance your meditation practice.